In a year underlined by several highly publicised events in the automotive and financial services industries, new car sales took a step back during 2018. Whether the decline represents a peak in industry sales - or rather, a mere breather in what has been a strong run of growth across successive years - 2019 is set to be an eventful year as dealers slash new car prices. 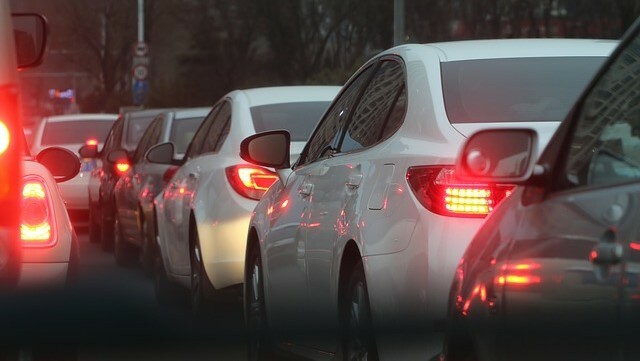 Following a record sales result the year prior, new car sales fell by 3% in 2018 to a total of 1,153,111 – a drop of 36,005 vehicles. With the exception of January and February, every other month recorded a decrease in the total volume of cars sold compared with the corresponding month during 2017. The effects of a sharp slide in house prices and changes to consumer finance regulations took hold, with New South Wales and Victoria most affected and leading the descent. Meanwhile, slow wage growth and the prospect of an election also weighed on consumers’ minds. However, it was the final two months of 2018 where the impact was most evident. Australian new car buyers effectively put away their wallets and tightened their spending. As a result, comparable sales for November were down 7.4%, trumped by a tumble of 14.9% during December. In fact, the sales result for December was the worst in 10 years - a time when the country was caught up in the GFC. Nevertheless, despite the fall, in a broader context last year was not as bad as headlines may suggest. It was the 11th time in which Australian new car sales exceeded one million units, albeit industry insiders remain cautious due to the self-reporting nature of the data. Cementing their position as the favourite type of vehicle among Aussie motorists, SUVs enjoyed a stellar year. 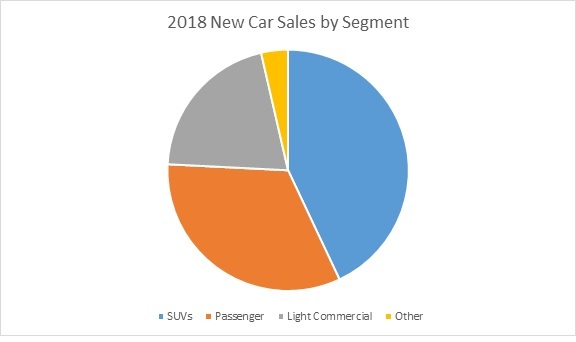 The vehicle segment grew to represent 43% of all new car sales in 2018, clearly the leading category. The rise of SUVs is all the more apparent when referencing sales from 10 years ago, when SUVs made up only 19.2% of total vehicles sold. The other segment benefitting in sales growth last year was light commercial vehicles, which rose 2.3% to a market share of 20.6%. The growth was led by significant demand for the category’s leading vehicles, which also topped sales charts across all vehicle categories. More on that in our next article. Elsewhere, passenger vehicles slumped 5% to 32.8% market share. The decrease signifies the first time the car category has dropped this low, as consumer preference continues to favour the other major vehicle segments. Stay tuned for Part 2 of our review into new car sales for 2018, covering vehicle makes and models.